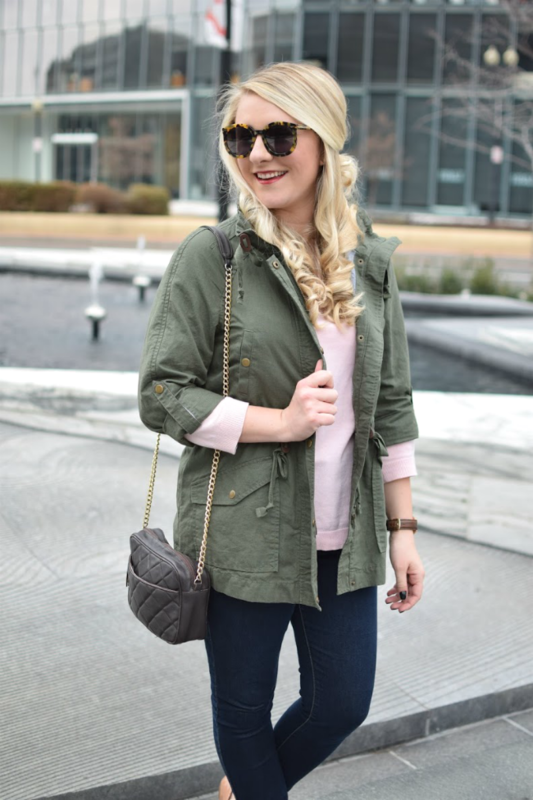 One of my favorite color combos for spring is olive and blush pink. This has also been a favorite color combo of mine in the fall. I feel like these two colors can work year round, simply by choosing the right pieces to pair together. This past weekend DC experienced warmer temps, finally!! While the mornings were cool, the afternoons warmed up into the mid-60s. On Saturday I knew I was meeting my friend Katie for an early brunch, but didn't know what the rest of the day would bring. So I chose a casual outfit that was comfortable for sitting at brunch for a few hours, but had some style in case we got into anything afterwards. Sadly my new favorite necklace broke only a few minutes after I left my apartment. So I felt a little bland without my fun statement necklace. But I did include a photo below with the necklace so you can see what it looked like paired with the outfit. Thankfully I was able to fix the necklace, but not till I got home and had already shot the outfit. 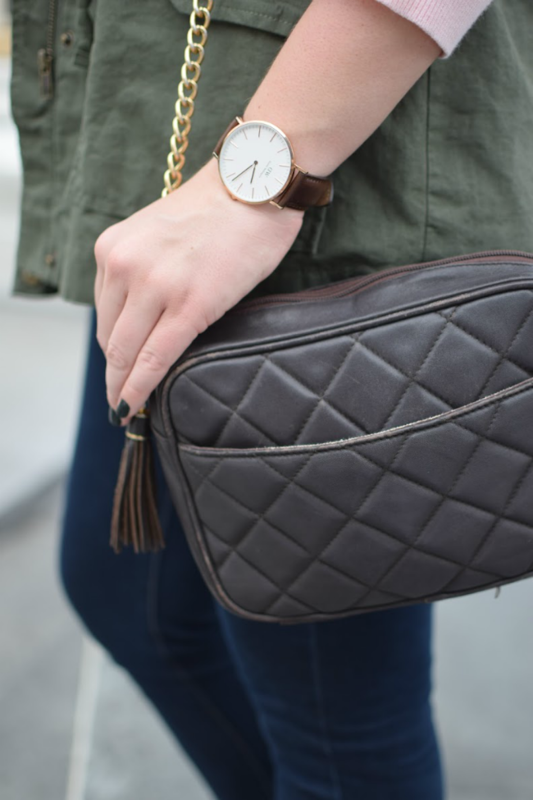 This is a not so glamorous story of behind the scenes of a fashion blogger, ha! 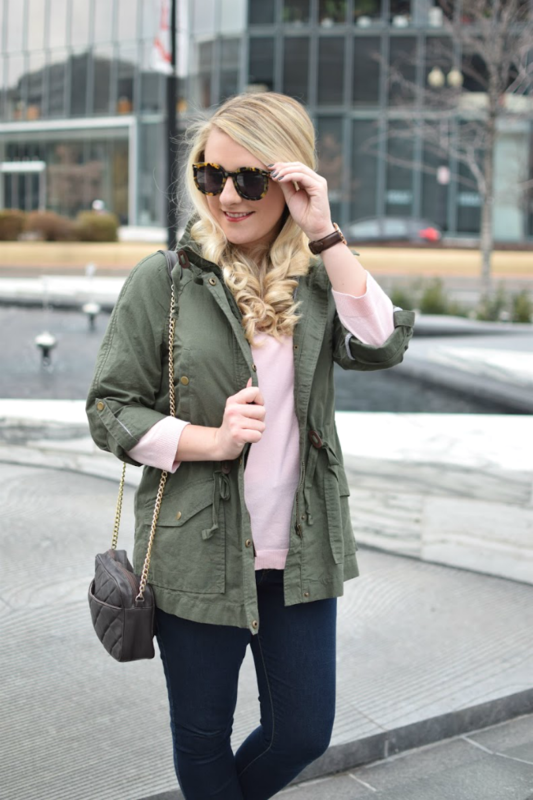 I paired this blush H&M sweater with an old LOFT field jacket (linked to an almost identical version from J.Crew above). I thought the color combo worked quite nicely. I then added a pop with my Lydell necklace and Daniel Wellington Watch (use code KRISTYNALYSSE at checkout to get 15% off your DW order). 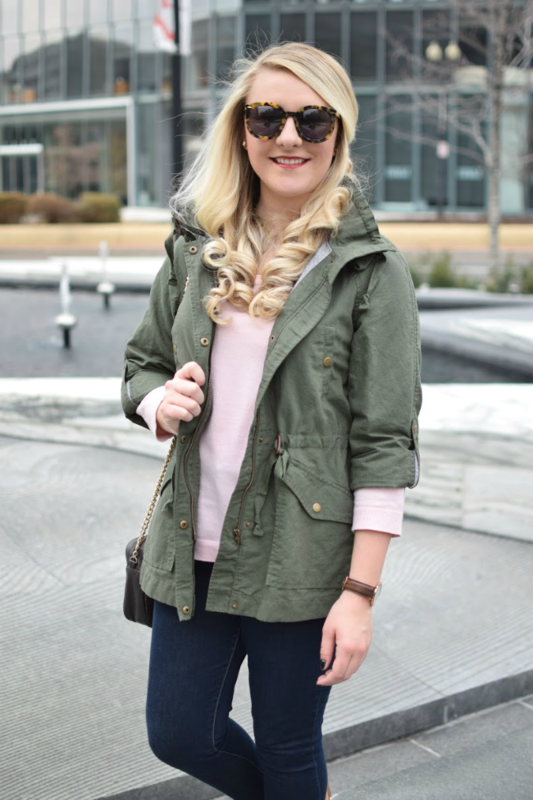 It was the perfect casual outfit for a spring like afternoon. I love this color combination! You styled this outfit perfectly! I love this look! The green jacket to the clutch!! Thanks Rachel!! Aren't those flats amazing?! Wish J.Crew still made them. Wear them weekly!! You're too sweet Anna, thank you!! It totally is Taylor, thanks! Can't wait to wear it more throughout the spring! I absolutely love this color combo and everything about your outfit :) Your necklace is stunning! I love this color combo! I've really been getting into all the olive things lately! Have/love/live in those glasses, they are the best! Me too!! Thinking of adding a few more olive pieces to my spring wardrobe too. Ahh I love them too!! Hate that I have to send them back, but looking to maybe purchase them myself soon!